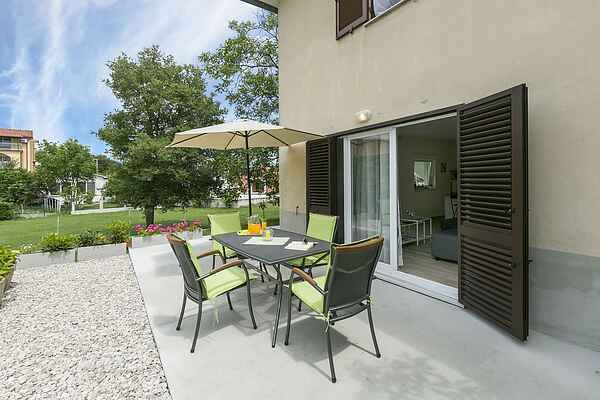 This modern and very well-maintained apartment lies in the quiet town Vinež and is situated on the ground floor of a holiday home. For a day to the beach you won't have to drive far, since the beautiful pebbled beach of coastal town Rabac lies at only 7 km distance! Here you can also find fun terraces and restaurants. In the medieval city of Labin (2 km), several events are organised during the summer, and there are fun shops and restaurants as well. Visit a museum here, climb the bell tower, or enjoy the view across the bay of Kvarner! Your apartment is comfortably decorated, has air conditioning and a modern kitchen with a cooking island. Outside you have your own terrace with garden furniture and a barbecue where you can wonderfully reminisce about your day. The open bedroom, just like the living room, has access to this terrace. On the upper floor there is one more apartment. You can get your daily groceries at only 1 km distance, and restaurants can be found in Labin.